Death metal may well all come from Holland if you ask me. 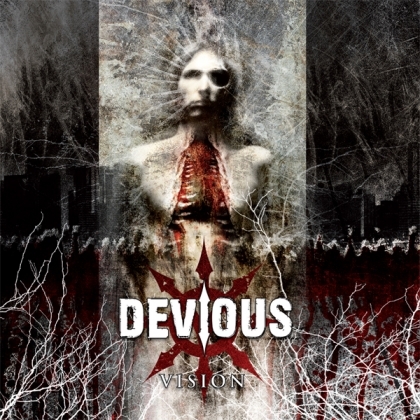 In 2003 I first heard DEVIUOS on their full-length debut “Acts of Rage”. I am very pleased they are still around and are making progress. Unfortunately unknown in Sweden they have played with bands like CANNIBAL CORPSE, DYING FETUS and VADER in Europe. Since their debut they have changed vocalists to Coen Tabak, who sang on their second album, “Domain”, and back again to Arnold Oude Middentorp. I hope this their third effort is at least as inspiring as their debut. “Heritage of the Reckless” opens softly with keyboards and choirs. The guitars (Guido de Jongh and Wouter Huitema) carefully prepares for the crossfire of riffs that follows. An impressive technical standard takes over and echoes of technical thrash. Some carefully placed synthesizer patterns and samples come courtesy of Carsten Altena (formerly Kapelmeister Kasz of THE MONOLITH DEATHCULT). The band has developed their arrangements well without losing enthusiasm or, possibly, the groovy hit feeling. “False Identity” reminisces of early forerunners like ATHEIST or NOCTURNUS, who brought on something new and fresh back in the day. A soft opening and then wham bang the bulldozer arrives. The same goes for the compelling “Resurrection of Fear”. A very professional arrangement and the song will haunt me for a long time. “Abide” is very close to thrash and the mix of a slight percentage of death is a success. This is death metal for the thinking person, and they keep waving the banner in “Impulse Overload”. The rhythm section is half new; Frank Shchilperoort (drums) is one of the founding members while Daniel Centiago (bass) entered late 2008. If I am to search for flaws “Validate” does not feel as inventive as the rest but that is a minor detail. Closer “Disconnect” puts a progressive ending to an impressive album. DEVIOUS have matured well. They have clung to their enthusiasm and grooves while plunging into an impressive heaviness paired with brutal inventiveness. Don´t miss out their tour with ENTOMBED if they pass by.